Engagement Party Ideas and Lolly Buffets – Congratulations! He popped the questions and you said yes! “Happily Ever After” has begun and what better way to announce your new couple-hood to the world than with one of our gorgeous candy buffets. Truly unique and unexpected your guests, will be thrilled! While many brides use our candy buffets as a decoration / bomboniere, engagements are generally a less formal affair and the candy buffet is well-suited to a cocktail event. In fact we more often than not find that once a bride has booked us for their Engagement we also get called back to provide another stunning buffet for the Wedding Day. Matching colours & style with a whole lot of fun spells – Party success! Your guests will be talking about it for years. It is really lovely to look around the room and see the sheer joy on your family and friends faces as they indulge themselves in your decadent candy buffet. Once the buffet is set up we suggest not opening the buffet until the later part of the evening after food service, sppeches and desserts have been taken care of. We suggest this because your guests will be so excited that their attention will be truly fixed on the candy buffet and we don’t want them to either not give their full attention to the speaker or be not hungry enough for the canapés/ meal / dessert that you have already paid and they quite possibly will not eat. The Australian market is currently flooded with cheap inedible imported candy which might look pretty but it is nasty! Our sweets are just that – sweet, tasty & fresh. As we are the largest candy buffet company in the world we turn over our stock at a rapid rate so freshness is guaranteed. With over 5 years experience in delivering thousands of candy buffets across the country (yes, we said thousands) we have a great understanding of what looks and tastes great. We only use high quality Australia made candy & chocolates and everything has been taste tested; if it’s not yummy it simply will not make the selection table. For your peace of mind, we are a food registered provider operating from a food register and council approved warehouse. Some rivals operate from home which is fraught with potential contamination & legal issues. The Candy Buffet Company also holds $20 million dollar public liability insurance. Our award winning team will ensure every little detail is included for your engagement party and nothing is overlooked. At the beginning, we outline the timeline of the candy buffet creation process so at no stage are you left wondering what is happening. You also have a dedicated Event Manager who will liaise directly with you so no information will get lost in translation. All customers have their own inspiration folder which we lovingly attend to and constantly add images you send us as well as gorgeous images we find ourselves. If you opt to add candy box labels to your candy boxes (highly recommended), we have an in-house graphic artist who will create your candy box label and send you an artwork proof for approval. Selecting the candy for your Engagement Candy Buffet really is a lot of fun, we can suggest what we know will look and taste great – and from here we tweak to perfection! We have literally 1000’s of delicious varieties to select from, so many gorgeous sweets in a rainbow of colours. We would suggest adding a variety of sweets to your candy creation so there is always going to be something for everyone – chocolate such as chocolate malt balls, chocolate honeycomb , delicious white chocolate rocky road, something sour such as sour straps (available in so many stunning colours), something jelly such as jelly beans and gummy bears, and we can also include big gorgeous lollipops! Our handmade artisan lollipops are hand made here in Australia not only do they look special they taste it too! We have them in every colour imaginable. At the conclusion of your Engagement Party one of our staff members will arrive back at the venue to pack up and remove the candy buffet if there are any sweets left over they are yours to keep. These will be popped in a food-safe snap lock bag and given to a nominated person or left in the safe hands of the venue Event Manager who is on duty that evening. In most cases we are a preferred supplier in most venues across Australia. The candy buffet was a big hit and it looked absolutely beautiful! What a great job your staff did! I know that the photographers took some professional photos so once I get them I’ll send them through for you to add to the collection. The centrepiece was my favourite, I loved the little baubles of rose petals hanging from the stems. The swizzle sticks, the honeycombs and the chocolate frogs were the most popular choice throughout the evening. All in all it was a great experience, everything was on-time and I thought it was really great how I would get confirmations and emails along the way about various things (graphics, candy selection, timing, the look etc). Best customer service and customised candy. What more could you ask for? They set everything up and packed it all up at the end and left all the leftovers with us. The arrangements of the candy and the candy itself was incredible and everyone loved the visual and the edibility. Thank you The Candy Buffet Company for making our day so special!! The candy buffet looked absolutely amazing! I was present when the candy buffet staff were setting up, they were so professional and polite it really made me at ease at such a stressful time, I just knew it was going to look fantastic. And I was right, the moment I walked into the venue it was the centrepiece and talking point of the night. All my guests loved it, and definitely enjoyed eating all the delicious candy and chocolate, especially the white chocolate covered raspberries. 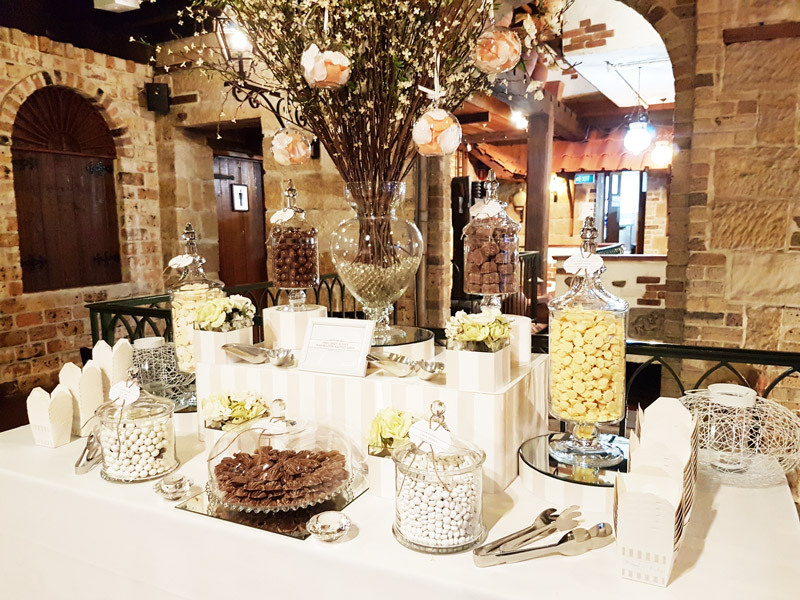 The candy buffet was my dessert at the venue, there was so much variety to choose from, and I was surprised that all the adults kept going back for more and more.I would like to thank The Candy Buffet Company for doing such a fantastic job. Not only did they do such a fantastic job setting up and making the buffet look amazing, the customer service was great I had a few follow up calls, they arranged the pump in times with the venue and suggested additional flower arrangements for my venue which matched the buffet. I would highly recommend The Candy Buffet Company to everyone, it’s fun, looks great and will definitely impress your guests. Request a quote for your engagement party now!